Get the perfect brew with Osaka.Brewing coffee is an art form, and it can be pretty challenging. We at Osaka would like to help you up your coffee game. If you follow our instructions and tips, and with some practice, you should be brewing the perfect cup of coffee in no time. Impress yourself and your guests with an awesome tasting coffee every time.Kawachi Fuji Garden is our Espresso Knock-BoxAnti-bacterial body The Knock-Box is made of special ABS plastic that prevents bacterial growth from the Inside.Rmovable Steel Knock-BarMade from steel the bar provides a strong knocking base. Can be removed easily for cleaning. The special coating around the steel bar is made from high-quality foam and will absorb most of the shock.Perfect SizingThe size is perfect for storing underneath most espresso machines. 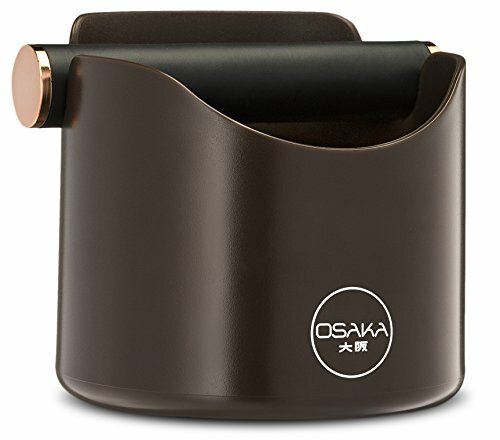 The capacity is large enough that you don't have to empty it too often.Non-slip gripBuilt-in rubber ring provides a strong gripping surface and will keep it from shifting during use.Dishwasher safe"Osaka"what does it mean?Osaka, is a large city on the Japanese island of Honshu, and is known for its modern architecture, boisterous nightlife and delicious coffee shops. We were inspired by their coffee brewing techniques, and from that "Osaka Coffee" was born. Every one of our products will look good enough to display, and will perform better than anything else. If you are not yet in love with the process of coffee-making, be prepared to be infatuated. - QUALITY GUARANTEED - For any defects in the materials or craftsmanship of any Osaka product, please contact our customer service team and we will be glad to assist you. - PERFECT SIZING - The size is perfect for storing underneath most espresso machines. The capacity is large enough that you don't have to empty it too often. - ANTIBACTERIAL BODY - The Knock-Box is made of special ABS plastic to prevent bacterial growth from the Inside. The knock-box and knock-bar are dishwasher safe. - REMOVABLE KNOCK BAR - The special coating around the steel bar is made from high quality foam and will absorb most of the shock. - NONSLIP GRIP - Built-in rubber ring provides a strong gripping surface and will keep it from shifting during use.